Save time and money in your food business with this delicious dessert recipe for the summer and BBQ season. 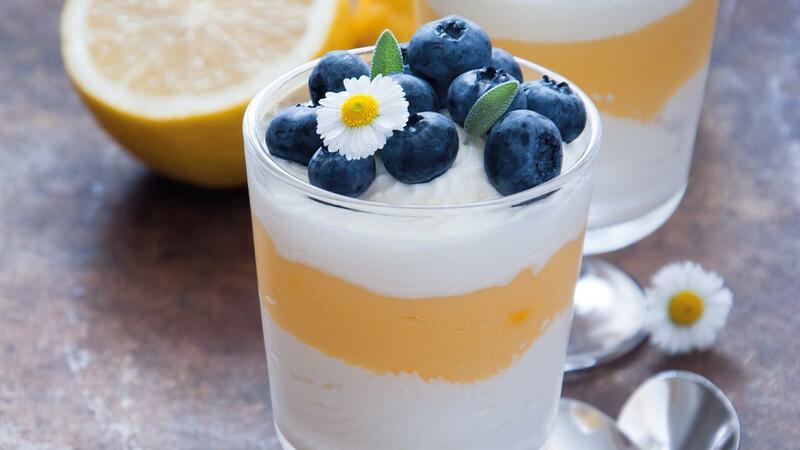 This layered version of a lemon verbena posset which has a lemon curd layer in the middle will surprise your guests. Place the MEADOWLAND Double, caster sugar and lemon verbena into a pan and bring to the boil. Add in 125ml lemon juice and then bring back to the boil. Pass through a fine chinois and allow to cool to room temperature. Pour half the mixture in the bases of the glasses and allow to cool for an hour. Whisk together 300ml lemon juice with the cornflour. Place the MEADOWLAND Professional, caster sugar and lemon juice mixture in to a pan. Bring the mixture to a boil whilst continuously stirring. Reduce the heat to a gentle simmer and allow the mixture to thicken. Remove from the heat and allow to cool prior to use. Once the lemon verbena layer has set, divide the curd across the glasses and add the final layer of lemon verbena posset mix. Chill until fully set and serve with blueberries to garnish.